Uttarakhand popularly known as "Dev Bhumi" is a beautiful state on the North of India. This state is blessed with strong cultural and religious beliefs, incredible natural beauty and is also known as "Land of sages and saints". Uttarakhand is land of holiest rivers, the spiritual mystery, dazzling landscapes, enchanting history carved in ancient stones, a mesmerizing flora and fauna and the simplest of the people. So, get ready for the ultimate travel experience which leave you with the numerous life time memories. No words can ever be enough to perfectly describe this blessed land. In your first footstep to incredible city Delhi, friendly and well-speaking representative of Plan Our Travel's will welcome you at Airport and assist you to reach comfortable hotel and check-in. Delhi - is a city that never sleeps. It is the 'Heart of India' and people from every nook and corner of the world landed here to enjoy their precious life in a most luxurious way. 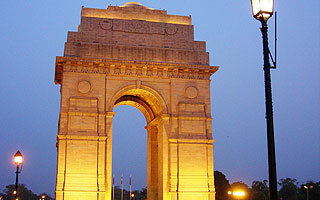 Most of the North India and Central India tours start from the metropolitan city. In the city, visitors can spend their precious moments of life with great fun and entertainment. Day or Night you can travel in and around the city according to your interest and convenience. City offers exceptional experience of vacation to each and every visitor whether domestic guests or foreign tourists. Different entertaining places in the city are perfect to spend lovely evening with your near and dear ones during your short stay in the region. Never skip to go for entertaining shopping in its local markets and comfy modern malls. Back to the hotel and sleep comfortably. After morning breakfast on the 3rd day of your voyage check-out from the hotel and drive towards Haridwar. On the arrival at Haridwar, check-in hotel and relax for a while. And, dress-up for haridwar sightseeing. The city of Haridwar is an entrance door to one of the most beautiful states of India Uttarakhand. The state is also described as 'Dev Bhumi or Land of God' because of its religious and spiritual values. In this ancient city there are multiple religious sites where you can offer prayer to have a blissful life in the days to come. Har-Ki-Pauri: Among the sacred places in the region Har-Ki-Pauri is a religious Bathing Ghat and commonly known as Brahmakund. The ghat is located on the Yamuna River and one of the main Ghats where devotees from distant places do a holy dip. Mansa Devi Temple: Ranges of Shivalik are precious gifts of nature and in its lap located one of the most sacred places of worship for Hindus, that is, Mansa Devi Temple. Devotees from various places arrive here and tie sacred threads on the sacred tree which is located in the complex of temple. Devotees return back here to untie the sacred thread after their wishes are fulfilled. En-route to temple is little adventurous, you will get a chance to cross the thrilling short ropeway. Ganga Aarti Ceremony: You will take a part in the Ganga Aarti Ceremony in the evening. The surface of the holy river Ganga is covered with golden hues of floral diyas (lamp). The sight will all the times magnetize the attention of the people in the region. Devotees think that they are in real heaven when hearing the sounds of tinkling bells and blessing words by the priests. 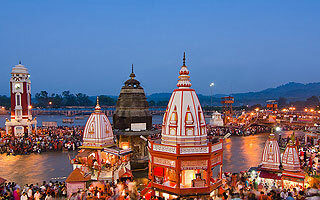 After visiting such religious sites, return to the hotel and overnight stay in Haridwar. Wake-up early and have your tasty breakfast. After breakfast, get ready to drive towards the city of Rishikesh. Rishikesh is also called as the Land of Yogi's as well as International Capital of Yog-Rishikesh. En-route to Rishikesh you will explore the Bharat Mata Temple. Bharat Mata temple: The temple is one of the religious places of worship and situated in Sapt Sarovar which is very close to ashram at Haridwar. The temple is constructed in 8 different stories and each story symbolizes a specific theme devoted to various deities and legends of the country. This makes the place of worship sacred and unique in the city of Rishikesh. On the arrival at Rishikesh, check-in hotel. Get fresh and ready for the Rishikesh Sightseeing. 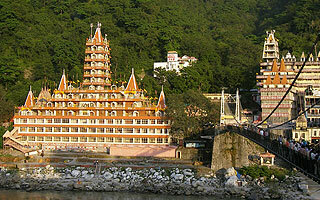 Rishikesh: The religious city is a gateway to Char Dham Yatra. The destination is popular all over the world for its religious and spiritual values. In present days, with the development in tourism sector, it becomes one of the hotspot destinations to enjoy some thrilling adventure activities. A few names of the thrilling sports you can enjoy here are Rafting, Trekking, Yog, Camping and Bungee Jumping. Ram Jhoola: Amazing Ram Jhools is a suspension bridge constructed between the Sivananda Ashram and Swarg Ashram. It is also popular as Ram Jhula. You can cross the river through entertaining boating. You can enjoy entertaining shopping here. Sides of the bridge are dotted with varieties of shops. Swarg Ashram: The location is a cluster of various Ashrams. Swarg Ashram is located in an area between Rishikesh and Lakshman Jhula. Here Ashrams are constructed in different styles and location offers beautiful, healthy and divine environment. From Ram Jhula you can reach the place by walk. Some of the beautiful places in the location are Bhootnath Temple, Parmarth Niketan, Gita Bhawan and Shops. Bhartiya Gramothan Sansthan: The Sansthan is operated by an NGO in-order to promote the handloom and handicraft by providing training for free-of-cost. And, it gives a way of livelihood for the local people. The Sasthan is one of the must visit places in the region and here you will witness as well as experience the hard-working women working. You will experience the traditional way of making different handicraft products and knitting. Back to the hotel and overnight stay comfortably. After morning breakfast, check-out from the hotel. Drive towards the city of Rudraprayag. En-route will pass to scenic sites covered with lush green meadows. The destinations are part of Himalayan ranges. Sure the scenic sites will surely hypnotize the attention of travellers. En-route you will visit Dev Prayag and Mallaitha. Malaitha: Malaitha is a unique village with strong history and located on the way to Rudraprayag. Local villagers are very hard working and offer great traditional hospitality in-order to make the visit of tourists comfortable. Interact with local people and spend some happy hours. Devprayag: This is the place where two rivers meet. 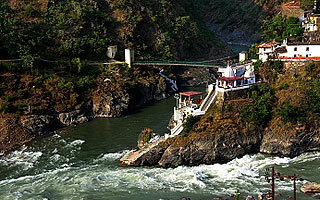 The names of the two holy rivers are Alakhnanda and Bhagirathi. Watch the eye-catching view of the location and witness how beautiful our Mother Nature is. On the arrival at Rudraprayag, check-in to the hotel and rest for a few minutes. You can spend rest of the hours in the Resort. Overnight stay at Resort, Rudraprayag and have a comfortable sleep. Koteshwar mahadev Temple: The place of worship is situated at a distance of 3 kilometres from the town of Rudraprayag. The temple is sited on the shore of the holy river Alaknanda. The temple is incredible and constructed in the form of a cave. Idols are worshipping here and all the idols are formed naturally. Devotees believed that Lord Shiva mediated here before going to religious Kedarnath. After morning breakfast, relax for a while. Pack your bag and check-out from the hotel. Drive towards the city of amazing Auli. You will experience Gondela Ride from Joshimath to Auli. Amazing Auli is situated in the state of Uttaralhand. The destination is popular all over the globe for the captivating ski resorts and beautiful natural vistas. The location is encircled with sky-touching snow covered peaks Himalayas. The slopes of the peaks are covered with tall lush green oak fringed and offer eye-catching sceneries. Here you can climb up-to an altitude of 2800 metres and from the point watch the panoramic view of surrounding. On the arrival at Auli, check-in to the hotel. Relax for a while. From your room you can watch the panoramic view of the surrounding with a cup of coffee comfortably. Overnight stay at Resort comfortably. After morning breakfast, get ready for Auli Sightseeing. Auli is one of the exceptional places of tourist interest in the entire globe. The destination is blessed with incomparable features of the Mother Nature. Every location of the location will surely lure the attention of tourists. Observe and explore the beauty of nature in its true colour. Back to the hotel and overnight stay lavishly. After morning breakfast, relax for some minutes and check-out from the hotel. Drive towards Kausani from Auli. On the way you will enjoy panoramic view of scenic sites. On the arrival at Kausani, check-in to the hotel and relax for couple of hours. In the evening get ready to visit the beautiful Kumao area of Uttarakhand. Kumao is a lovely hill station. Beautiful Kausani is blessed with incomparable features. The landscapes of the hill station lure the heart of tourists. Kausani is an amazing land covered with lush green meadows and covered with blanket of snow in the winter season. Features you will experience and discover in the hill station are Silent Valleys, Himalayan Peaks and Lovely Chirping Sounds of Birds. Watch across the coniferous trees. From the top of Kausani enjoy the eye-catching views of Nanda Temple, Panchachuli and Trishul. Back to the hotel, get fresh and relax. Overnight stays in the hotel. Enjoy morning breakfast and dress-up for Kausani Sightseeing. Anasakti Ashram: Hill station always offers cool and calm environment right. Anashakti Ashram in the region of Kausani is a very scenic place offering comfortable and pleasant surrounding so that a tourist can relax lavishly. This was the place where Mahatama Gandi wrote his commentary on 'Geeta-Anashakti-Yog'. Visit the historical site and experience about the Anashkti Yog. Pant Museum: The museum is well-protected, the birth place of Sumitra Nandan Pant (famous Hindu Poet). You must not skip to visit the museum during your holiday. The gallery in the museum has a collection of more than hundreds Hindi and English books. These are rare books and displayed properly in glass shelves. Lakshmi Ashram: The Ashram was established in the year 1964 by Catherine Hilman. The Ashram was established with a great aim for the development of Kumaoni Women and helping them. The Women are taught different skills such as cooking, growing vegetable, caring for the animals and other domestic works. Visit the place and experience the value of social-service. Tea Gardens: It is one of the most beautiful destinations and perfect to enjoy leisure evening. Giria Uttaranchal Tea Estate is very beautiful and every site offers picturesque view. The garden is situated at a distance of 5 Kilometres from the town. 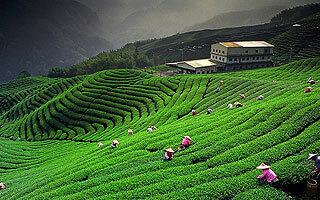 Discover the beautiful tea plantations and enjoy lovely evening. Return to the hotel and overnight stay comfortably. After morning breakfast, check-out from the hotel and drive directly toward Almora. Almora: The destination is a tourist paradise. From the wonderful destination you can enjoy the beautiful view of Himalays. Travel across the various peaks and make the tour an unforgettable experience. Watch the beautiful peaks and make yourselves wow feeling experience. On the arrival at Almora, check-in the hotel; get fresh and ready for Almora Sightseeing. Shiva Temple: Visit religious Shiva Temple and offer prayer to have a blissful life. The destination is surrounded by beautiful huge fur tall trees. The temple is dedicated to Lord Shiva. Almora fort: The historical monument was constructed during the Chand Dynasty and given to the local people. It is positioned at the highest point of Almora Bazaar. The fort has a strong history and worth to visit during your journey. From the fort watch the 360 degree view of the location and other countryside surrounding. Lakhuudiyar: World famous Lakhuudiyar is situated at a distance of 12 Kilometres from Almora. In the complex located a prehistoric rock which contains beautiful paintings of human beings, group of dancers, lizards and other animals. It is believed that Lakhuudiyar exist since the time of Broze age. Bright End corner: Bright End Corner is world famous Sunrise and Sunset Points. The destination is an ideal place to relax by watching the tranquil beauty of environment. Nanda Devi Temple: Sacred Nanda Devi Temple is prime tourist site in Almora. Devotees believed that Nanda Devi is the patron goddess of the bygone era Chand Dynasty and the villagers. Sculptures and images on the walls of the structural building are amazingly beautiful and are intricately sculptured by the experts. Every nook and corner of the temple lures the attention of visitors. Back to the hotel and overnight stay happily. After morning breakfast, check-out from the hotel and drive toward Jageshwar Temple. Jageshwar is situated at a distance of 35 Kilometres from Almora. The complex is renowned all over the world for its religious value. The sacred place of worship is counted among the sacred 12 Jyotirlings. In the complex there are more than 100 shrines. The three most famous shrines in the complex are Pushtidev, Jageshwar and Mrityunjaya. The Jadeshwar temple is constructed with great architectural design and decorated with eye-catching sculptures. Travel happily and watch the beauty of surrounding. Back to the hotel, enjoy dinner and sleep happily. After morning breakfast, get ready and drive towards Ranikhet. On the arrival at Ranikhet, check-in to the hotel. 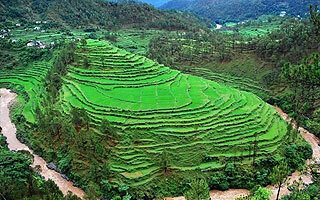 Picturesque Ranikhet is beautiful location surrounded by high lofty hills covered with blanket of meadows. The lovely town with amazing landscape is a part of Almora district and visited by people from various destinations to explore its beauty. Enjoy the beauty of lovely destination with great fun and entertainment. Spend leisure time with your near and dear ones in a most lavish way. After Morning breakfast, dress-up and get ready for Ranikhet Sightseeing. Upat and Kalika Golf course: It is the Asia's Highest 9 Hole golf course. The destination offers tempting environment to the nature lovers as well as golf lovers. Golf lovers from domestic destinations as well as foreign people visit the place to play golf. In and around the golf course, you can also visit Kali Temple and Nursery Juxtaposing. Jhula devi Temple: The religious temple was constructed during 8th Century and devoted to goddess Durga. The sacred place of worship is surrounded with lush green ranges. The complex offers pleasant environs to relax peacefully. Here also located a temple devoted to God Rama. Rani Jheel: Stunning Rani Jheel is the most recommended artificial lake and worth to visit. It was dug between two natural ridges namely Canossa Convent School and Kendriya Vidyalaya. Discover the captivating sceneries. Cantonment Ashiyana Park: The Park was constructed elegantly so that everyone here can enjoy leisure time with great fun and entertainment. The complex is amazing and perfectly lay-out different sections. Children's Park, Water Fountain, Herbal Garden and other lush green lawns. From the park you can observe the eye-catching view of Himalayan Ranges. Relax lavishly here. Kumaon Regimental Centre Museum & Memorial: The famous complex was established in the year 1974 and it is a symbol of Bravery and Ultimate Sacrifice of Army Soldiers. Museum in the complex was built in the year 1978 in-order to promote and exhibit the rich and magnificent legacy and customs of the Kumaon Regiment. This is the place where young boys train before becoming soldiers. After morning breakfast, check-out from the hotel and drive towards Nanital. On the arrival at Nanital, check-in to the hotel. Hill Station Nanital is the summer paradise in the country. Beautiful hill station is also known as the Lake District of Uttarakhand. Discover the tranquil beauty of the place during your Uttarakhand tour. Amazing landscapes in the place will make you hypnotize. This is the one and only hill station in North India where you can discover the speechless beauty of Mother Nature. There are multiple eye-catching tourist sites. One of the most beautiful is Nani Lake. 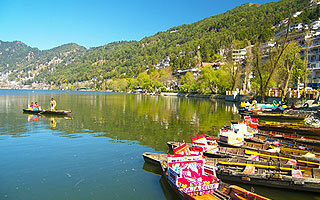 Make sure to enjoy boating at Naina Lake and spend your lovely evening lavishly. You can also go for shopping when your get back to the hotel. Overnight stays at hotel in Nainital. After morning breakfast, get ready for Nanital Sightseeing. Naini Lake: Naini Lake is an ideal picnic spot in Nainital. Enjoy entertaining boating in the lake with your travel partner in a most romantic manner. Spend leisure time in the captivating surrounding. The lake is also renowned as Tri-Rishi Lake. Explore the beauty of stunning lake. Naina Devi Temple: The sacred holy place is considered as Shakti Peeth of Maa Durga. It was destroyed by landslide during the year 1880. The place of worship is situated on the northern shore of the beautiful Naini Lake. Snow View: Cable Cars are the means to reach the Snow View which is at an altitude of 2,270 metres above the sea level. The location is situated along the Sher-Ka-Danda ranges. 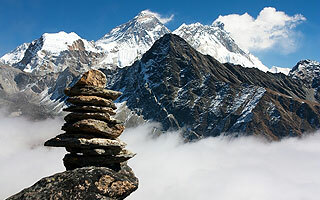 From the point you can watch eye-catching ranges of Himalayan Mountains. You can also witness the Tibetian Borders from here. St. John's Church: The amazing architectural design of the church magnetizes the attention of visitors. The church is the oldest one in the region of Nainital. Land's End: The mesmerizing site is situated at a drive of nearby 4 kilometres from the town of Nainital. From the Land's End you can enjoy the attention-graving view of Khurpatal. Astronomical Observatory: Visit the centre and enjoy your tour. It is located very close to Hanuman Ghari. It is one of the most famous Research Institute of Observational Sciences. Back to the hotel and overnight stay happily. After morning breakfast, check-out from the hotel and drive towards Corbett. On the arrival at Corbett, check-in to the hotel. Jim Corbett national Park: Jim Corbett National Park is the most famous Tiger Reserve Centre in the entire world. The wildlife centre is situated in the foothills of the lofty Himalayas. The National Park is home to varieties of exotic flora and fauna. The common wild species roaming freely in the forest are Elephants, Tigers and Leopards. The national park is the perfect place for wildlife lovers to enjoy thrilling wildlife tour in India. The site was established on1st April 1973 and recommended as a site for the conservation of Tiger Species. The region is covered with dense forest and other beautiful landscapes. Discover the unique features of the dense forest and observe wildness activities of wild animals freely in their habitat. You will get a chance to discover the venue through Jeep Safari. According to your interest, you can choose the zone to enjoy thrilling Safari. You can enjoy Safari in morning or evening. Note: From 15th November to 15 June is the best time to visit the national park. To visit the destination required to take permission from the Forest Department. After morning breakfast, relax for a while and check-out from the hotel. Now, you are going to leave the beautiful destination Corbett and drive towards Delhi. On the arrival at Delhi, check-in to the hotel and spend lovely evening in the hotel. Enjoy scrumptious dinner in the hotel and overnight stays. After morning breakfast, relax and get ready for the Delhi Sightseeing. Delhi Eye: Here you will enjoy and experience one of the activities, that is, Giant Wheel. The Giant Wheel is about 200 feet high and the only one of its kind in the nation. While rotating in capsules you will enjoy Recorded Historic Story. The service is available for 20 minutes and you will enjoy the spectacular view of city during day and night scenes. Back to the hotel and spend your last night comfortably. On the last day of your Uttarakhand Calling Tour, after morning breakfast check-out from the hotel and our friendly tour representative will transfer you to the airport. From here you can fly towards your home sweet home. Hope you enjoyed your holiday lavishly.